If you have a quick temper, if you shout, if you slam doors, your problem may not actually be your anger. The real emotion that may be hurting you is what’s lurking behind your anger: shame. For many of us, anger is a cover for shame. Shame isn’t an emotion that’s talked about a lot in our society. There are no shame management classes, it’s often confused with guilt, and it’s not an emotion we actively choose to feel. We watch comedies because we enjoy laughing and dramas because crying feels cathartic, but has anyone ever said, “Tonight I’m in the mood to watch something that makes me feel ashamed”? 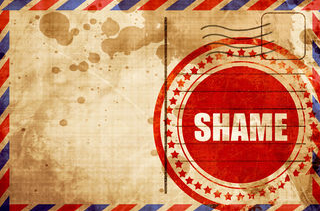 Shame is also the only emotion that can bind with other emotions. You can feel joy, sadness, fear, disgust, and anger all while you simultaneously feel shame. Today we’re going to talk specifically about the combination of shame and anger. For many of us, we carry around secret feelings of shame for years. Something we did in our past — or something that was done to us — haunts us. Shame can be a major anger trigger because when we harbor shame, we tend to react defensively when we’re criticized or given even mild feedback. We may then use anger to divert attention away from our painful, hidden feelings the way a magician uses misdirection when performing a card trick.